Log Home Manufacturers -- How Do You Choose? With over 400 log home manufacturers and 125 producers that create handcrafted log homes it can be a difficult choice deciding which one is best for you. Buying a cabin from log home manufacturers is a big investment, not only of money but also of your time and commitment. Following these simple steps will narrow down your choices and make the final selection as easy as possible for log home manufacturer as well as log cabin suppliers. You can save a lot of money by keeping your short list of log cabin companies to those who work in your area. This will ease the construction process and allow a more hands-on approach to your build. By staying local you also save on shipping costs and can often schedule deliveries in stages so you don’t have to worry about long-term storage on the job site. Find out which log home manufacturers have representatives in your area and begin with these log companies. They will have better insight into local building codes and conditions and may be able to help you source specific materials or builders. 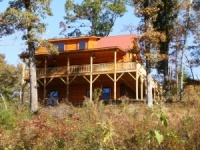 Most log home manufacturers specialize in wood types or log profiles. If you have your mind set on milled oak logs, for example, or handcrafted white cedar, you have already narrowed your list of log home companies significantly. Do a little research into log cabin manufacturers working in your area and see what they are offering. Keep an open mind about your material choices and log cabin floor plans before you eliminate each log company. Each of the log cabin manufacturers has something to recommend them to someone and you need to find which one is the best fit for you. Once you’ve established a manageable list of log home companies you need to start digging deeper into each one. Go to their websites and read everything you can find about what they offer and how they do business. Make notes about things you like or questions you may have; request brochures and cabin floor plan books to compare features. Educate yourself about what to expect with log cabin kits and how to prepare for a log home package. Before you get too far along it’s a good idea to bring your builder or contractor on board to get their insight into what each log company is offering. Even if you are planning to act as your own general contractor you need to speak with your builder to understand what materials are not supplied and will need to be sourced locally. Depending on what level of log home package you are planning on (log shell, dry-in, turn-key), there may be significant additional work to do and subcontractors to line up. You can help yourself to save money on your log cabin kit by keeping your design straight-forward. If you have the desire to build your cabin yourself you need to have some construction experience. You can learn about the challenges of building a log home and the unique cabin building tools involved. Carefully study the various plans and log home manufacturers information and be sure you completely understand what they provide and what they don’t. Did the log cabin company stay involved? Was there something they wished that they had done differently? Did the log home company accurately describe their product and service? One way to link up with other log home owners and hear about their experiences is to connect on-line by reading cabin blogs and forums. Read through the various posts, ask questions and be prepared to replay the favor by offering your take later on. Once you’ve prepared yourself fully, it’s time to meet with log home manufacturers face-to-face. The easiest way to do this is by attending a log home show where dozens of the major log cabin companies will be able to answer your questions and give you hands-on demonstrations of their products. These log home shows take place over a long weekend so you have plenty of time to visit with each of the log cabin manufacturers in attendance. If you can’t make it to a log home show you can often go to the log home producers plant and take a tour of some of their log homes. This is a good chance to meet with the actual representatives that you may be dealing with and will help you assess their level of customer service. Not until the last step should you be comparing prices between different log home manufacturers. Cost is an important issue but you must be fully aware of what’s included with your log home package and the various steps required to complete your log home before you have a fair way to compare prices. Log home packages can vary significantly in price and you need to be able to assess what the differences are and where they arrive at their price. Examine the log packages closely and decide if the price differences are justified by what you are getting. You may be able to save money by tweaking your log cabin home design and skipping exposed rafters, for example, or by eliminating an extra corner. Picking between log home manufacturers can be stressful when you should be enjoying dreaming about your log home. Start your log cabin building process off right by sticking with these steps and narrowing your choices to the best log cabin company for you.